Skip the queues with priority boarding! 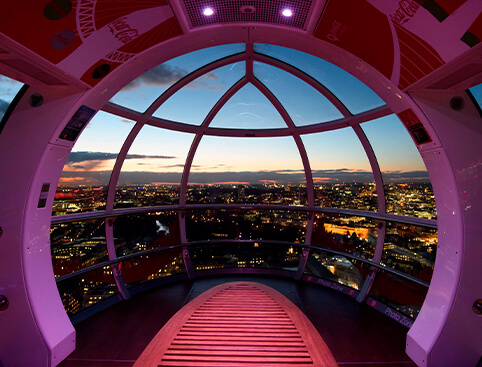 Visit The London Eye as part of our BIG 3, including London’s most exciting attractions! Visit The London Eye as part of our BIG 6, including London’s most exciting attractions! Take the weight off your feet with a sightseeing cruise on the River Thames! A fascinating live commentary by specialist guides really brings the city and its landmarks to life. Fast track entry through a dedicated entrance. 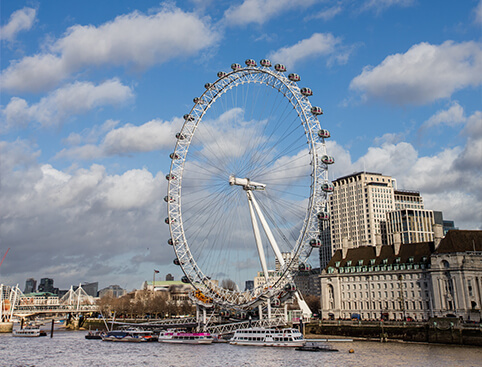 NEW London Eye Guide App now available for FREE download on iOS and Android. Your ticket must be used on the date you select when booking. Go to the Fast Track entrance 15 minutes before your allocated time slot. Don’t Miss: Amazing 360° views of London and beyond! 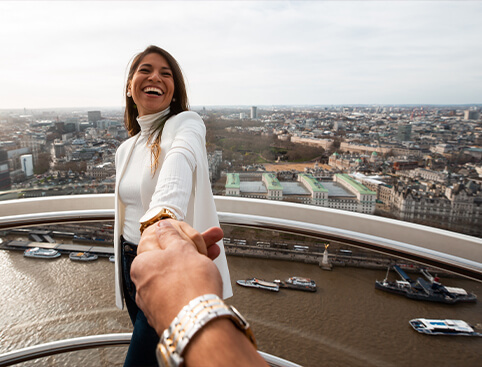 Experience one of London’s most popular attractions and enjoy spectacular 360° views over the city when you book London Eye tickets! 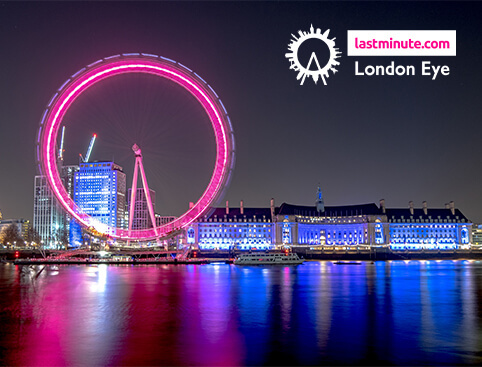 At a staggering 135m high, the London Eye is the world’s tallest observation wheel, with unparalleled views of famous landmarks like Big Ben, Buckingham Palace, St. Paul’s Cathedral and more. Each “flight” is a leisurely 30 minutes in your climate-controlled glass capsule, so you’re guaranteed a comfortable viewing experience whatever the weather! Discover London like you’ve never seen it before! Each capsule has interactive touch screens which let you find out more about what you’re seeing, and bring the fabulous views to life. 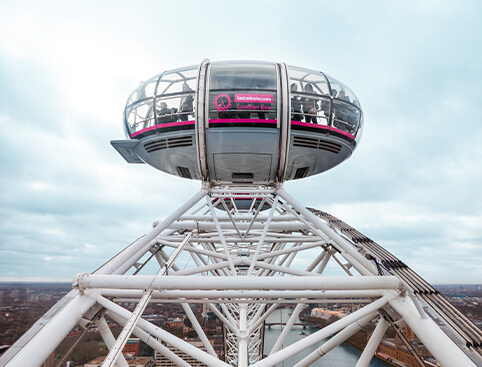 Your tickets now also include the London Eye 4D film, featuring the first 3D aerial footage of London and more 4D sensory effects than any other attraction in the UK! Places go fast on this popular attraction, so book now to avoid disappointment! In January 2019, the London Eye annual closure for maintenance will be from TBC. Please check with the attraction for specific opening hours on the date you plan to visit. The London Eye will close for annual maintenance in January 2019, the dates are TBC. The London Eye River Cruise will close for annual maintenance in January 2019, the dates are TBC. The London Eye closes early on Christmas Eve and New Year’s Eve. The London Eye is fully accessible for disabled guests, with wheelchair access and disabled toilets. Please Note London Eye River Cruises are currently not suitable for wheelchair users. If you wish to see the 4D experience, join the 4D entrance queue with your tickets 45 minutes prior to your booked time. Please call us for a group rate, rates are available upon request. The London Eye is located at Riverside Bldg, County Hall, Westminster Bridge Rd, London SE1 7PB and is easily accessible by Bus, Rail and the London Underground. The nearest Tube stations are Waterloo, Westminster, Embankment and Charing Cross. Coca-Cola London Eye Tickets is rated 4.5 out of 5 by 49. Rated 2 out of 5 by Anonymous from Way over priced Bought tickets in advance cost over £100 for 2 adults & a 10 year old, as we bought fast track, we were given a time slot to board which was good as is massively cut down on the queue time. Experience lasted half an hour. In my opinion not really worth the money, it’s ok to do, but if you’re on a budget, I’d skip this one. Rated 5 out of 5 by We love London from Wonderful sunset views Great at any time of day but sunset was magical and we all loved it. Rated 5 out of 5 by Georgiastorry from Stunning views!! I brought tickets as part of a romantic weekend break in London. We brought the London Eye and River cruise tickets. We missed the river cruise on the day we booked for but the ticket people gave us tickets for the following day instead, which was great. We went on the London eye at 6pm which was perfect because we saw the city as the sun was setting, the views were beautiful. The next day we did the river cruise at lunch time, it wasn't busy at all which was great as we obtained a prime seat. The tour guide was so funny when pointing out things to look at and the sun came out for us which was lovely. I would highly recommend doing both the London eye and river cruise as it gives you the chance to see London from above and from ground level.